Take overe very opportunity about you with the tools Telenor 3G internet offers and explore new territories. The Telenor Group has already launched 3G in 11 countries under the first step of ‘Internet for All’ to make mobile and internet connectivity accessible to everyone. And now it’s Pakistan’s turn. It is time to breaking away away from the mundane, and invite excitement and curiosity into your life. ON THE GO MOBILE INTERNET, LIKE NEVER BEFORE! 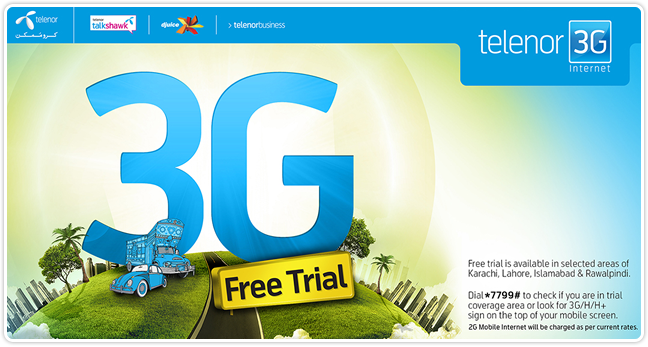 Enjoy free Telenor 3G Internet trial in selected areas of Karachi, Lahore, Islamabad and Rawalpindi. Dial *7799# to check if you are in the coverage area. This section covers Telenor 3G Internet Bundles for Prepaid users. Bundle details will be added here soon. This section covers Telenor 3G Internet Bundles for Postpaid users. Bundle details will be added here soon.